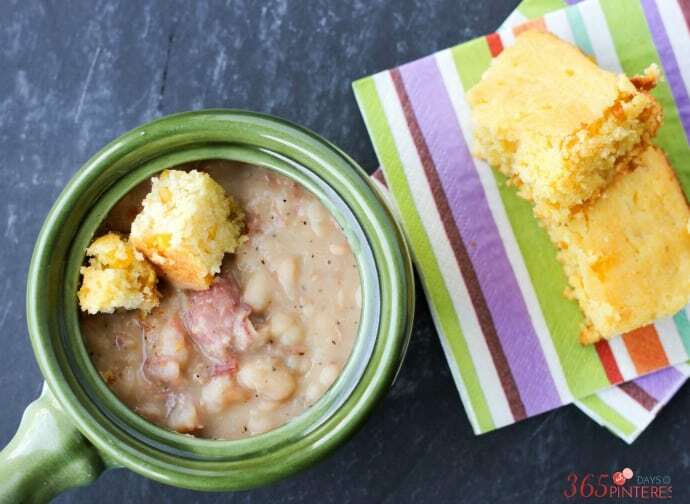 Ham and Beans is a hearty and inexpensive comfort food, perfect for using up leftover ham! Add cornbread and you’ve got a delicious meal. Well, guess what? This stuff was YUMMY. I ate it for dinner, then for lunch the next day and again the next day! 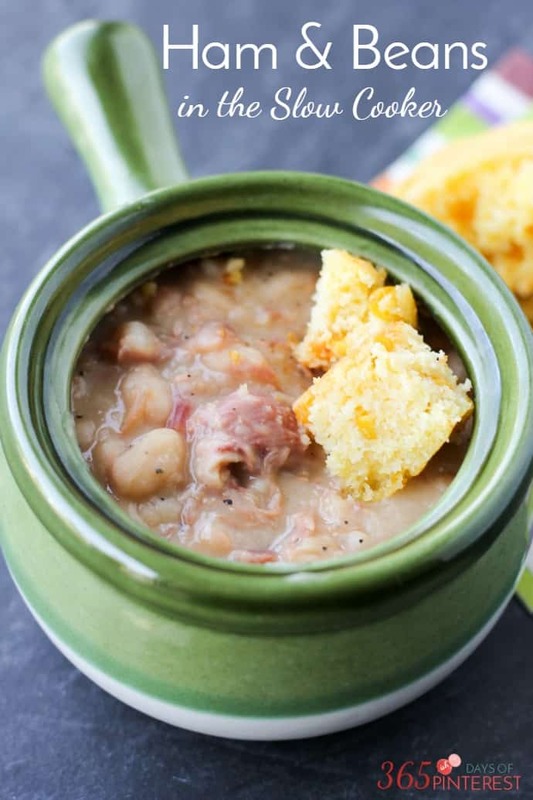 The salty ham and the creamy (yes, they get soft and creamy) beans are a great pair. Add some tender cornbread and you’ve got a warm, comforting meal that’s going to fill you up for pennies. I was really surprised by how much ham came off the bone after being in the slow cooker all day. I expected to eat bean soup with a little ham flavoring, but it ended up being quite meaty. Obviously, that depends on how much meat you have left on the ham bone to begin with, but a gentle slow cook all day will pull that meat right off the bone. If you are looking for ways to use up some leftover ham or not let a ham bone go to waste, then I’ve got you covered! 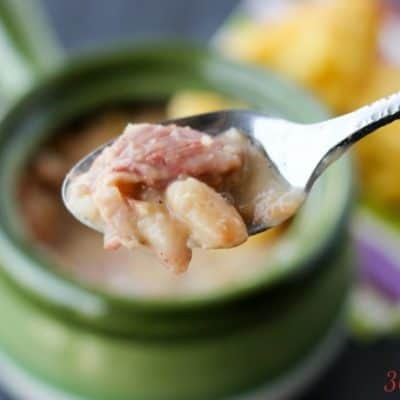 Ham and Beans is a hearty and inexpensive comfort food, perfect for using up leftover ham! Add cornbread and you've got a delicious meal. Rinse the beans and pull out any pebbles you find. Add the beans, ham bone (or ham), onion powder, and seasoning to the slow cooker. Add water and cover. Cook on low for 8 hours. Remove the ham bone and pull off any meat still left on the bone. Stir meat back into the soup and serve with cornbread! Add the ingredients to the pot, close and lock the lid and turned the steam release valve to closed. Press Meat/Stew and adjust time to 60 minutes. When cooking cycle is done, do a natural pressure release for 20-30 minutes until the pressure is fully released. Open lid and remove ham bone. Pull any remaining meat off the bone and stir into the soup. 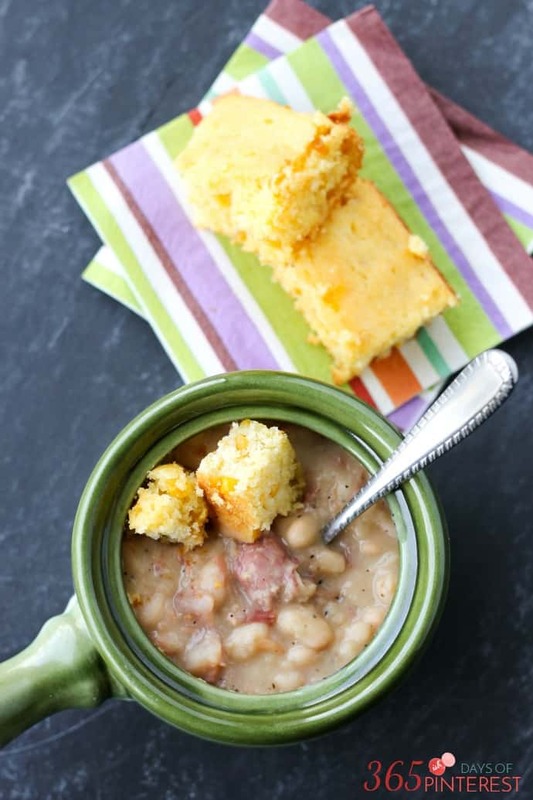 For extra moist and delicious cornbread to go with Ham and Beans Soup, try this Cornbread Casserole recipe! 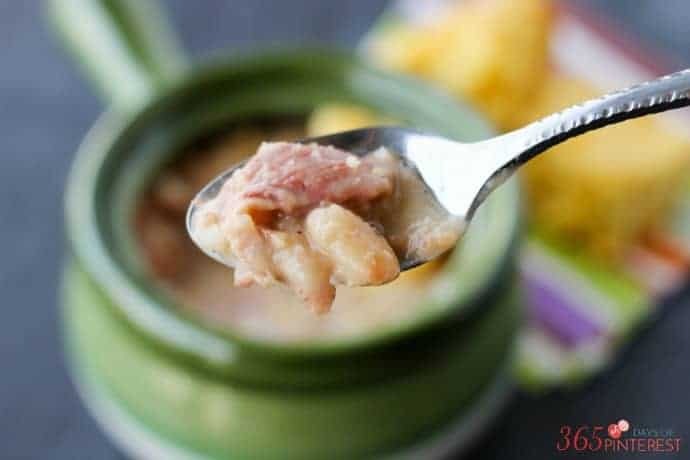 For more great recipes using leftover ham, check these out! Baked Macaroni & Cheese w/Ham from Who Needs a Cape? His soup is amazing! I cookies in Crock Pot Express. So that they do not cause gasiness…I brought the beans to a boil on stove..added a pinch of baking soda and rinsed well. I also sliced up some mini carrots and celery. Thank you! Will make it again!